Who loves a bit of bling? I'd like to say me but it wouldn't be true. I'm not a girly girl. You only need to look at my battered canvas pumps and last seasons handbag to see that shopping isn't my favourite past time. I like diamonds but they are more of an acquaintance than a best friend and if you do ever happen to catch me wearing a dress it's probably because I'm on my way to a wedding. But show me a pen that dazzles and delights and I'm putty in your hands. 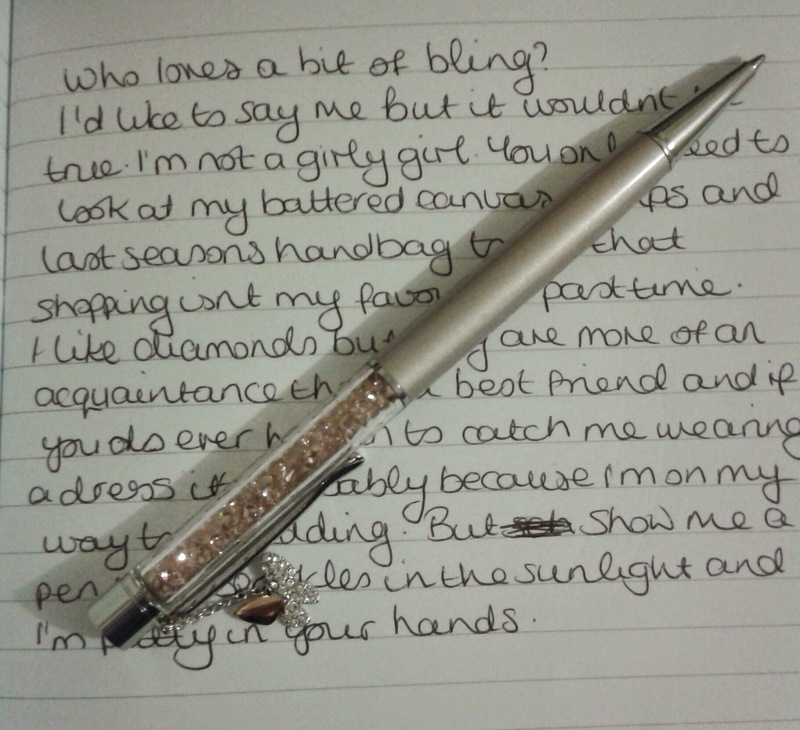 When House of Fraser offered me the chance to review the Swarovski Crystalline Lady Ballpoint Pen I jumped at the chance. What's there to think about? We all need at least one bling thing in our lives right? Be it bags, shoes, diamond rings or in my case, a gorgeous pen. Pen bling is the only kind of bling likely to turn my head and get my heart racing. When the Swarovski pen first arrived I sat by the window for a good long while turning it over and over, admiring the shimming pink crystals in the sunlight. There are around 140 Swarovski crystals neatly arranged within this pen and it's fascinating to look at. 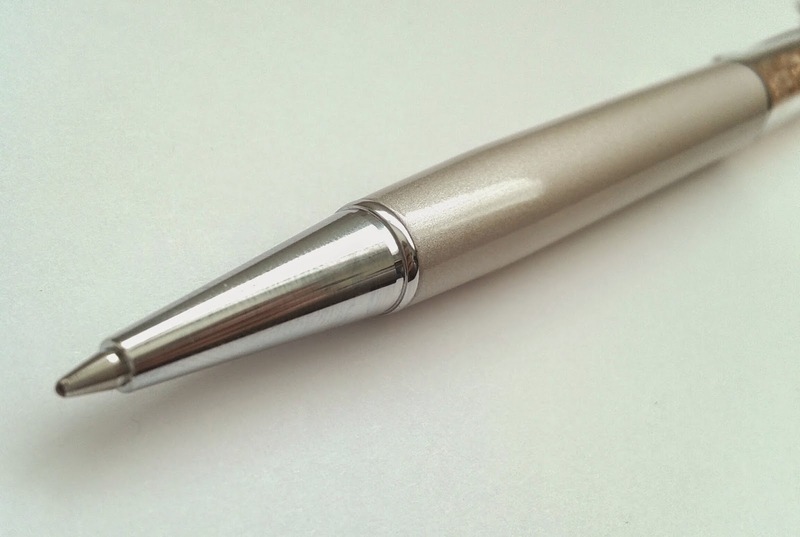 The body of the pen has a beautiful pearly shine to it. I'm undecided on the colour. I can't decide if it's pink or purple or both or neither. It depends on the light and which angle you view the pen from. I knew this was going to be a pretty pen but I wasn't prepared for how quickly I would fall in love with the butterfly charm. If I had been presented with this very same butterfly dangling from a silver necklace I'd have been over the moon. Three of its wings are decorated with approximately 20 clear crystals and the other wing is rose gold metal plated and is so ridiculously shiny that I could see my face in it. This is definitely not your average pen charm. Not only does this pen look great, it feels luxurious too. Here's where you're going to think I've completely lost the plot. The most comfortable position for holding this pen is above the cone shaped tip, a good 20mm away from where the pen meets paper. You may have noticed my many ramblings about various pens with grips too far away from the tip and here I am, with a pen which has no grip and I'm happy about my finger positioning which may as well be miles away from the tip for all the moaning I've done in the past. But it works. I think the pens slim frame and evenly balanced weight is a huge factor. It's the perfect fit for my fingers. As I write, the butterfly swings from side to side which originally I was sure would become a nuisance but in fact it amuses me slightly. Even the rhythmic tip tapping of the butterfly against the pen as it swings is endearing rather than irritating. I noticed that during extended writing sessions slipping was only a minor issue. There may not be a grip but being able to hold the pen loosly without a battle with gravity meant the pen stayed put for the most part. Look at me gushing over this pen. Maybe the butterfly has hypnotised me into only being capable of paying compliments. I'd better find the boyfriend, it's been a while since I paid him a compliment, he'll love this. Ok so I've made my point, I like the pen but will this ballpoint fall at the final and most important hurdle? It's time to test it's writability. I've tossed my scribble pad aside for the time being as this pen has been producing ink, first time, every time so it's a great start. With a ballpoint I've come to expect a certain amount of skipping but actually, the refill in this pen isn't bad. Yes some letters appear a touch lighter than others but the ink never gave in and all my letters are complete. I really have nothing to complain about. Those dreaded ballpoint blobs and gloops are nowhere to be seen, the pen is easy going on paper and writing is non eventful in the good sense. The pen uses Schmidt mini refills. So maybe I'll need to change the refill a little sooner than usual but that's ok, it's the way it has to be if I want to keep the pink crystals. Schmidt isn't a brand I've used before and I have to say I'm impressed. I'll definitely bear Schmidt in mind when refilling my ballpoints in the future. 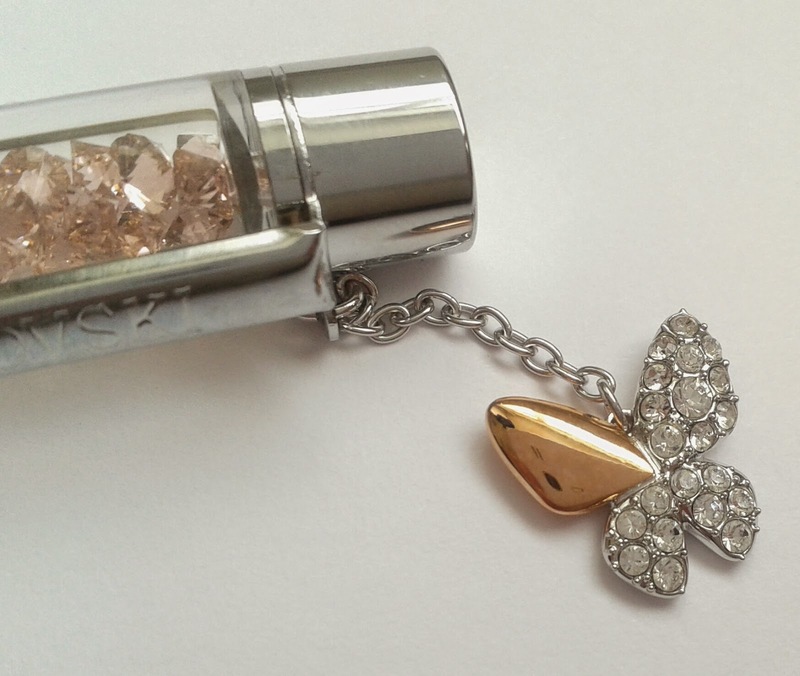 The clip proudly displays the Swarovski name and so it should. Swarovski is a name I'd previously associated only with jewellery but it's clear they have so much more to offer. The clip has a small amount of flex in it. It's enough for me to be able to clip it to my pocket or notepad easily but not enough for it to be easily knocked off and lost. I'd have no choice but to walk the streets pinning LOST PEN signs to every lamp post if that were to happen. I really wasn't expecting to be so excited by this pen. The more I use it the more I love it. 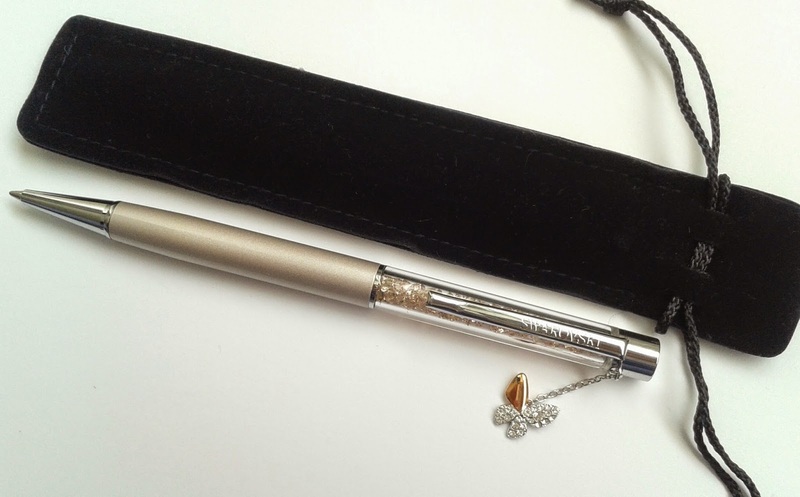 This Swarovski pen is elegant, feminine and sylish and has used it's sparkly charm to bring out the girlier side of me which is something many have tried and failed to do. Christmas is closer than you think so if you know someone who would love this pen then you can find it over at House of Fraser. Thankyou to House Of Fraser for providing me with this pen for the purpose of this review. All opinions in this review are entirely my own. I probably have more Zebras in my pen collection than any other brand. Not intentionally, don't get me wrong, I love Zebras but mainly because they are in most stationery shops I visit so they are pretty much unavoidable. Those naughty Zebras can be very persuasive when they want to be, twisting my arm all the way to the check out. The Zebra Sarasa has been part of my collection for a few months now. This pen was recommended to me on numerous occasions by different people so I felt I had no choice but to try it for myself. I wouldn't want to feel like I'm missing out on anything. I wasn't blown away by the Sarasas appearance. It's a pretty name so I'd hoped for a pretty pen to match. I went online in search of a meaning to the name and found that Sarasa means Swan. When I think of a swan I imagine a beautiful creature gliding graciously across a lake, barely a ripple in the water. I also remember the countless times I've run from swans flapping their huge wings at me while I've been trying to feed the ducks but when they're not hissing at me I can really appreciate their beauty. The Zebra Sarasa doesn't really have any features that stand out so a swan wasn't the first image to come to mind when looking at it for the first time. 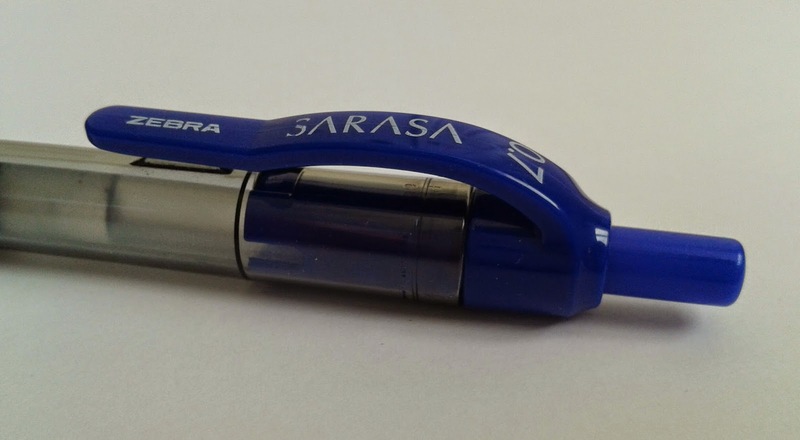 The Zebra Sarasa is made from plastic aside from the blue rubber grip. The transparent body of the pen allows me to keep tabs on my ink usage which is always a plus - no nasty surprises. It is retractable using the clicker button. The rubber grip could do with being a little closer to the tip but that's my own issue not the the fault of the Sarasa. I've been practising holding pens further away from the tip in the hope that I will get more enjoyment from some of my higher gripped pens. My progress is slow. Changing my pen holding habits after all these years is not easy but I'm giving it a good go. The grip has a slight squashy feel to it. I do prefer grips with minimal movement when squeezed. Having said that, it is still comfortable to use. There isn't so much texture that I'm left with indentations on my fingers and it does keep slipping to a minimum so it's doing it's job. The Zebra Sarasa has a medium 0.7mm point which although it isn't quite my favourite (fineliners will always be my number one) it's a close second. My lines are a decent width, not so thick that I feel I need to adjust the size of my handwriting accordingly so no complaints there. 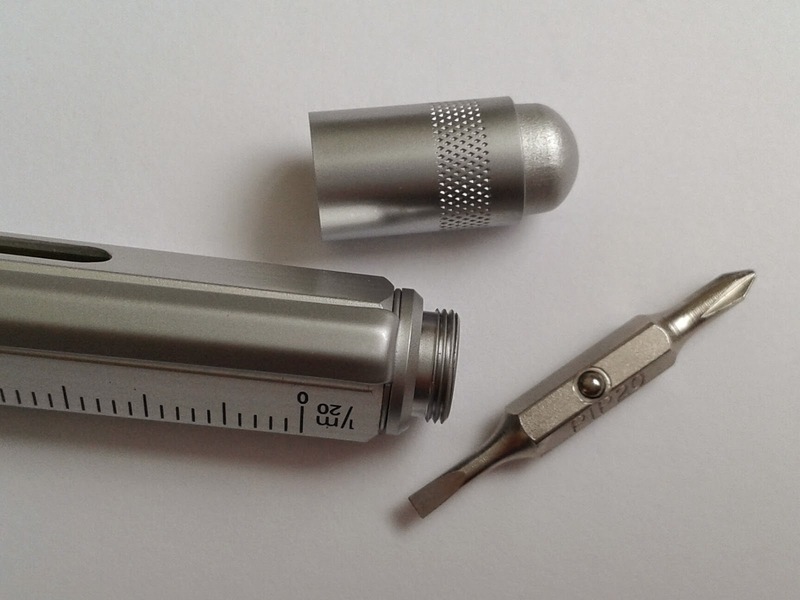 For those who are particular about point sizes, fine and a bold versions are also available. The gel ink inside the Sarasa flows consistently without issues. No skipping or false starts, just good solid evenly inked lines. The ink is quick to dry. I was in a nitpicking mood so I tested it in every notebook I had and found that as with most pens, it's not completely immune to smudging but almost. A 1-2 second dry time on most of my pages is in my opinion not bad going and on others it was immediate. I didn't see any feathering or bleeding through the pages. As a left hander I was especially pleased. The Zebra Sarasa takes to paper like a duck to water, moving across the page smoothly and confidently allowing me to really enjoy the experience. I can just zone out and write without any irksome distractions like scratching or too much/too little resistance. When I look down at my page and see that each and every letter is perfectly formed I realise that my uninspiring ugly duckling of a pen did indeed become a beautiful swan. Let this be a reminder that it's what's on the inside that counts. The fact that I've had this pen for months without breaking it adds to my joy when refilling it. The bond I've formed with my Sarasa doesn't need to be broken. I get no enjoyment from throwing an empty but otherwise perfectly good pen in the bin. The Sarasa takes the JF Zebra refills which are placed in the pen by unscrewing just above the grip at the writing end. The refill just sits in, no faffing about. Be careful not to lose the spring (obvious but easily done!). The clip is quite flexible so it's very easily attached to a notebook or pocket but unless it's clipped to something reasonably thick it's also just as easily detached. It would be fine clipped inside my pocket where it can't fall very far and I can keep checking it's there. Or maybe unlike me you are sane and think the pen would be no bother to replace if lost considering the reasonable price they can be picked up for. 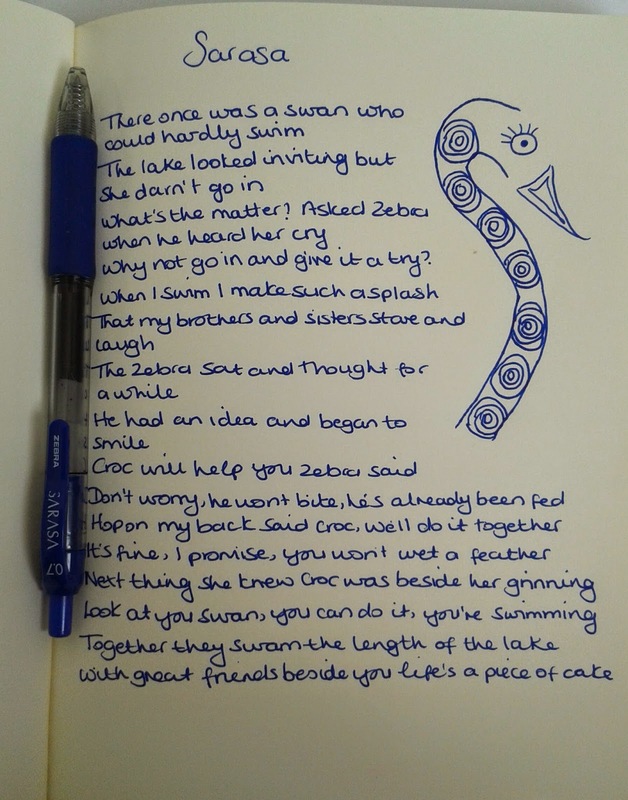 Of all the Zebra pens I've had the pleasure of using up until now I'd say the Sarasa is my favourite. It's maybe not the most attractive of the Zebras but it definitely delivers when it comes down to the important part - the writing. Not every one appreciates the wet inky look but I absolutely love it. "Pssst, over here, I may look like a boring old rollerball but wait till you see what I can do on paper.. don't tell anyone though, I don't want everyone fighting over me"
Are we ready for another giveaway? Disney princesses and the Teenage Mutant Ninja Turtles have been with me since childhood so it's lovely to see see the children in my family just as excited about them as I once was. The sets I'm giving away very nearly ended up in my novelty pen pot so enter quick before I change my mind and keep them for myself! 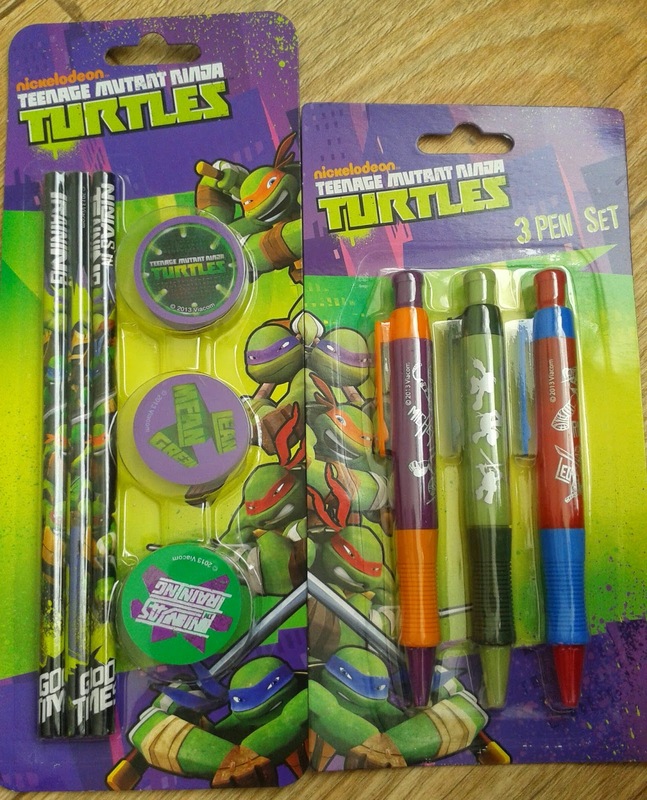 The Turtles set includes 3 ballpoint pens and 3 pencils with eraser pencil toppers. 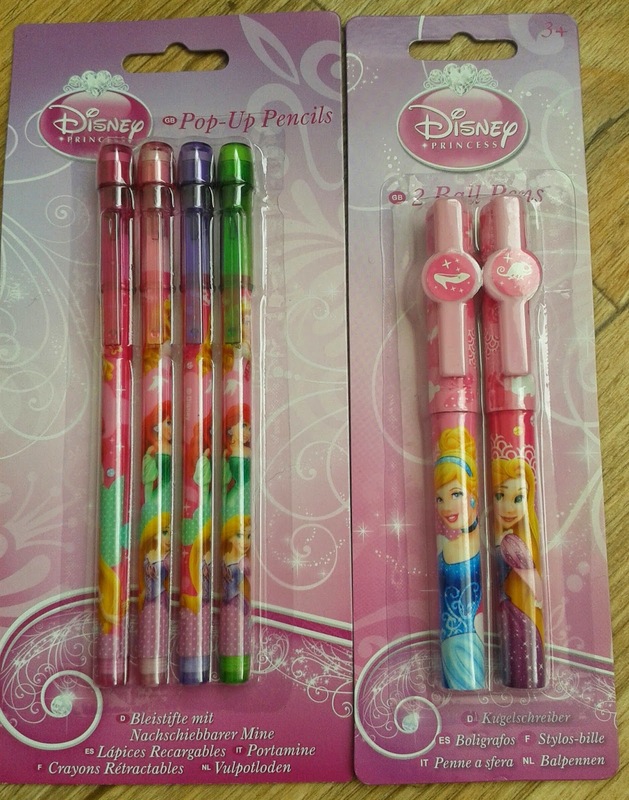 The Disney Princess set includes 2 ballpoint pens and 4 pop up pencils. There will be two winners, one for each set. Leave me a comment letting me know which set you would like to win. If both winners have chosen the same set, the first winner picked will receive their first choice and the second winner will receive the other. 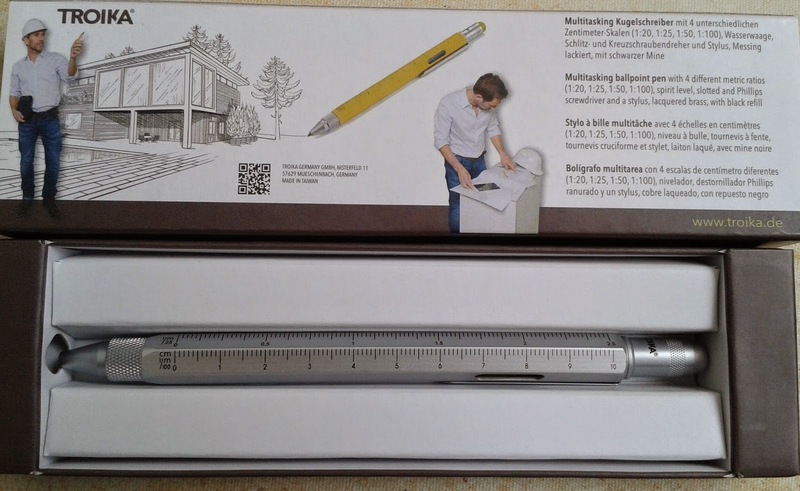 I'm a sucker for multi-functional pens so when I heard about the Troika Construction pen with its ruler, stylus, screwdrivers and spirit level it went straight onto my wish list. It's good to be prepared for every eventuality right? From looking at the packaging you would be forgiven for thinking this is a mans pen, for builders, engineers, hard hat wearers and the like. It certainly looks like it belongs on a building site, clipped to a tool belt or nestled behind an ear. I don't do any DIY and I haven't a clue what half the tools in the shed are for but I'm pretty sure I can still make good use of this pen. 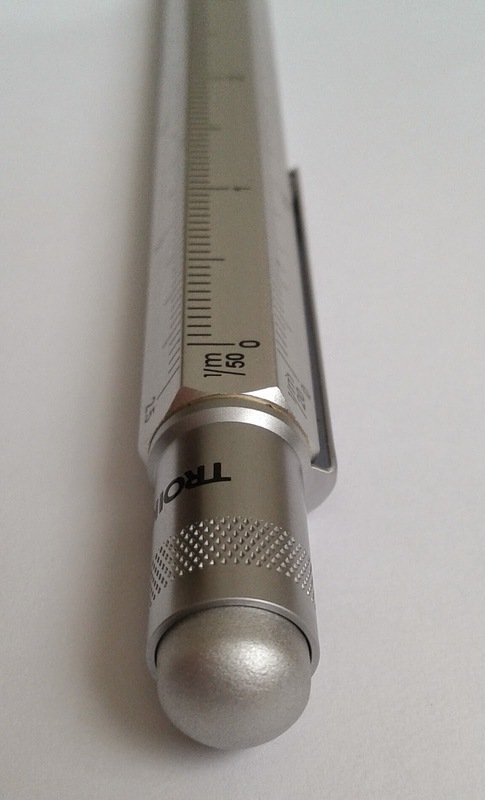 The ruler with its 4 different metric ratios (1:20, 1:25, 1:50, 1:100) is the pens most obvious feature. I may not be the one with the DIY skills in my house but now when I'm asked to fetch a 40mm screw I no longer need to fetch the whole tub. I'll get it right first time and maybe even do a victory dance while I'm at it. The stylus was the next thing to grab my attention. Conveniently positioned at the end of the pen it's handy to use at any given moment. I don't know about you but I don't find texting on a touch screen as easy as the teenagers make it look. I'm forever catching the wrong letter, adding the wrong contacts and pressing send before I've even finished composing. Using a stylus prevents any more embarrasing text typos. The stylus on this pen works perfectly on both my phone and tablet. I love how the colour of the stylus blends in with the pen. I can see it's there but it doesn't look out of place or stand out too much. It's a stylish stylus. The pens comes in a few different colours and the stylus on each pen matches it's colour. 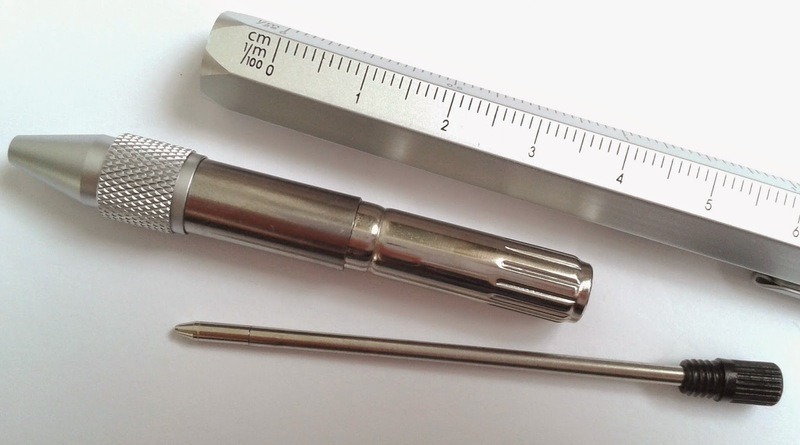 Neatly tucked away under the stylus is another of the tools cleverly incorporated into this pen, the double ended screwdriver which is revealed when the stylus is unscrewed. Once I'd chosen which end I needed (Slotted or Phillips) I found it slotted easily and firmly in place. The screwdrivers are really only suitable for small screws but I managed to find many more unconventional ways to use them. The slotted side made a great letter opener and the TV remote that is usually a pain in the backside to prise open is now a piece of cake. It's also good for slicing modelling putty. The Phillips is handy for those pesky toys that require you to unscrew several tiny screws in order to access the battery compartment. The RC car for example, the one that sends the dog into a barking frenzy and then runs over your toes painfully removing three layers of skin resulting in you confiscating the stupid thing for the rest of the week. Next up is the spirit level. Now occasionally I'm known to hang a picture or two and usually the stand back and admire from afar method works for me when judging if it has been hung straight or not. Now I can be absolutely sure that my handy work is spot on thanks to the spirit level very cleverly installed in this pen. My boyfriend tried the spare bubble trick on me which I didn't fall for much to his disappointment. I think he's hoping I lose interest in finding clever and unusual ways to use my Troika tool pen and end up handing it over to him. Hmm, I think not. Nice try though. The Troika Construction pen has already been useful to me in so many ways and that's before we've even been near a piece of paper. It is after all a pen, to be used to write with, a fact that can easily slip your mind when you're busy tinkering with household items. The body of pen is a hexagonal shape and is made from lacquered brass and is retractable using the twist mechanism. It's a hard wearing pen that will withstand quite a few drops and knocks. Weighing in at 40g it's one of the heavier pens in my collection. There is no real grip on this pen but if there was a grip where would it go without obstructing the ruler? On this occasion I'm willing to sacrifice comfort for novelty factor. I don't have any other pens that can be used in as many ways as the Troika Construction so that definitely counts for something. The pen itself feels ok to hold in terms of finger positioning but the lack of grip combined with its weight and bulk forces me to tighten my grip causing aching hands and makes writing feel clumsy at times. The ink inside this refill strikes me as a little weak. It appears more grey on the page than black and on closer inspection my lines are not as solid and sharp as I'd like them to be. The ballpoint is however smooth on the paper and the refills reluctance to give me any more ink than is necessary means my writing has been blob and smudge free. Changing the refill is quick and easy. 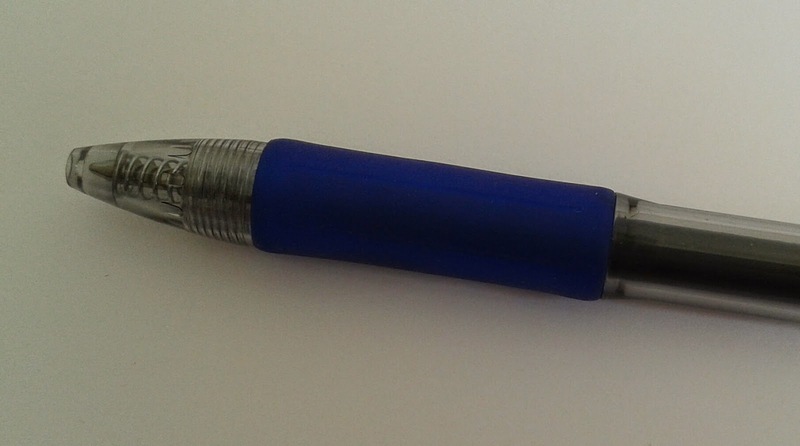 The pen pulls apart as pictured below and the refill can be unscrewed. The Troika Construction takes D-1 refills which are smaller than the average refill but the alternative would be no spirit level so again I'm happy to compromise this time. Frequent refilling gives me more opportunities to experiment with a few different refill brands and colours until I find my perfect match. Every cloud had it's silver lining! Silver was my colour of choice. 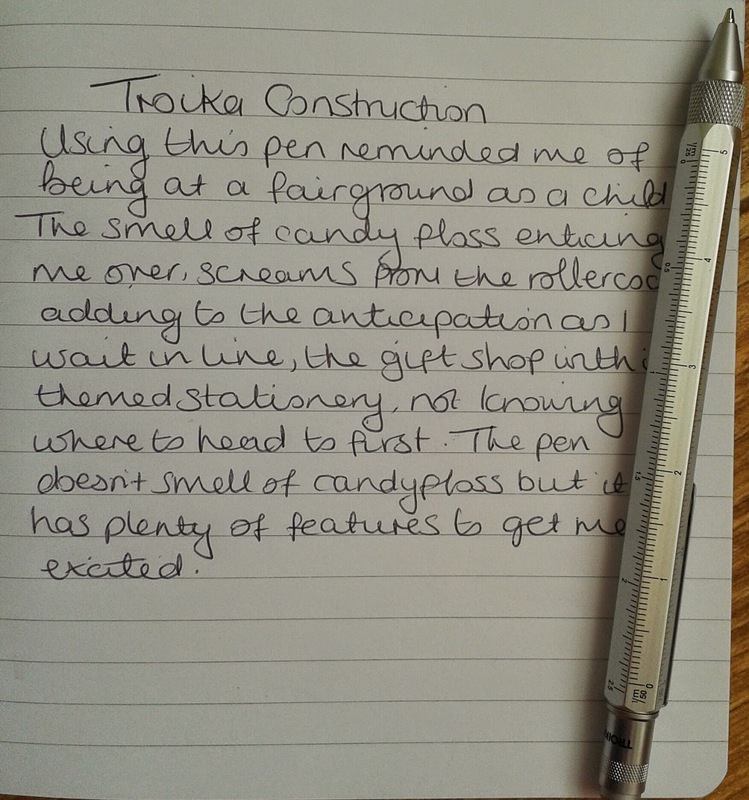 I thought it looked the most sophisticated but for those of you who love your pens to stand out from the crowd and reflect your personality the Troika Construction pen is also available to buy in yellow, black, blue and red. As a pen collector I somehow manage to find something interesting about each and every pen I own but this pen is definitely one of my most interesting ones. It may not be the right pen for long letters or essays but when it comes to general note taking or list making it's more than capable. If I had to choose one pen to keep with me at all times it would be the Troika Construction. Half the fun is finding weird and wonderful new ways to make use of this pens fun features. I can't wait for that moment when someone asks "Anyone got a spirit level?" so I can whip my Troika out of my bag and go Tah Dah! I kind of wish I'd kept this pen a secret from my family because the yellow or black version would have made an amazing novelty stocking filler for my boyfriend next Christmas or birthday but he's seen it now so maybe I can find it in me to let him borrow mine from time to time. Thanks to Executive Pens Direct for providing me with this fun pen to review. All opinions in this review are my own.